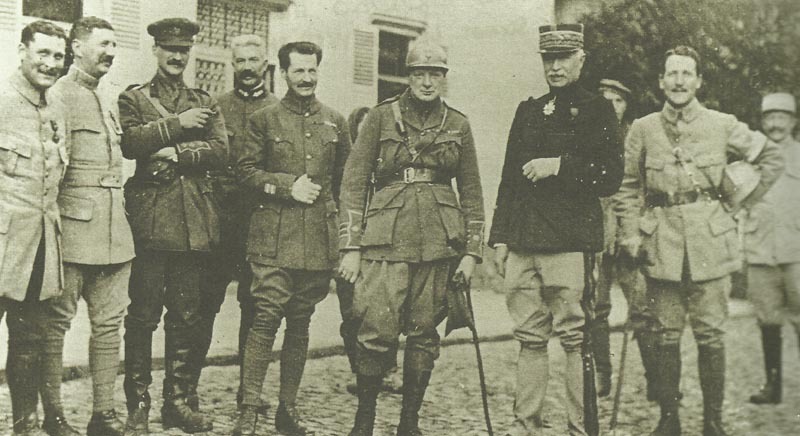 Winston Churchill (center, with helmet and cane) at the Western Front, after his dismissal from Britain’s government over the Gallipoli fiasco. Britain – War Council of Five appointed: Asquith, Bonar Law, Balfour, Lloyd George, McKenna. Churchill resigns from Cabinet (public November 13), farewell speech on November 15, joins BEF on November 18. Lord Derby warns single men of compul­sion if not enlisted before November 30. Marriage after Registration Day (15 August) will not exempt. Champagne: Renewed attacks at Tahure reported. Germans twice repulsed. France: Regiment de Marche de la Legion Etrangere (3,186 soldiers) formed from 4 battalions including one of the Italian Legion, becomes second most highly decorated French regiment of war. Serbia: Serbs recapture most of Kacanik Gorge north of Uskub (Skopje). French attack to outskirts of Kosturino inside Bulgar frontier (until next day) but fatigue, supply problems and Bulgar reinforcement halt it there. Mesopotamia: Townshend begins advance on Baghdad, surprises Turks at El Kutunie, occupies Zor (November 19), but getting only 3/4 of daily supply requirement. Greece: King dissolves Parliament, German Mission arrives.